What would you like to know about me? Banking in the UK is killing me! Or: Where did I leave my chequebook? Everyone seems to rant about banks these days, so let me join the ranks. But while I don’t really mind German financial institutions (I even used to work for one a long time ago), banking in the UK is just a nightmare for me. Let’s start from the beginning (where else?). You move to the UK. You want to open an account. Easy when you have a banking history here. Which of course I didn’t. The next best thing to have is an address. Now that I had but how to prove it? Where I come from, we move house, we go and register with the local registry office, and the new address is put onto our identity cards. End of story. From this moment on, whenever anyone asks us for our address, we just produce our ID cards. Simples. Not so in the UK. In the country of the island monkeys, you prove where you live with a utility bill. Well, I had moved in with my husband and guess what, all the utility bills were in his name. Go figure. I’m sure eon has heard the request before but I felt decidedly weird calling them up to ask that my name be put onto my husband’s account as well. And then you wait. For the next bill. Half a year later, if you’re lucky. You might get a utility bill a bit quicker if you decide it was time to change to a cheaper energy supplier anyway. Just make sure that they get your post code right, otherwise your new bill will be of no use when trying to open said bank account. Well then, alternatively you can also get us your tenancy agreement – as long as it is printed on letterheaded paper. Are you deaf?! I moved in with my husband and it’s his flat. No such thing as a tenancy agreement, sorry. Ah, but there is always the council tax bill. Except, this is only ever in one occupier’s name, and all the other liable people in the household appear on the side. Which, of course, is not enough and won’t be accepted as proof of address by your friendly bank. Grrrrrrr!!! Well, finally, your name is on some bill, the post code is correct too, so you get the account. Yay! And a big wad of … nah, not banknotes, cheques! What am I supposed to do with these? In Germany I haven’t used a cheque for, I don’t know, 15 years? Take them, you’ll see, you’ll need them. OK.
And indeed, a lot of the bills you get you can only pay cash or by cheque. Weird! Whatever happened to the good, old bank transfer? What?! People don’t want to put their bank details on the invoices they write because they are afraid of identity theft??!! Oh yeah, because in Germany, everyone who has his bank details on every business letter he writes (i.e. everyone), had his identity stolen at least 3 or 4 times already, right! Never mind, let’s use cheques and kill some more trees then, shall we? Monthly nursery fees for the little one? Cheque! Private doctors’ bills? 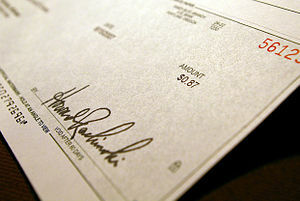 Cheque! You seriously have to stuff a cheque into an envelope and mail it off! And I don’t even want to think about the amount of administrative hassles that this medieval practice causes the receiver. Or the bank. 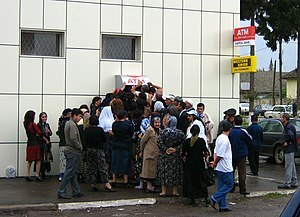 By the way, as unpopular as bank transfers are on this island, direct debit seems to be even worse. On a par with selling your soul to the devil. No wonder that companies like our new energy supplier will give you huge discounts for the privilege to relieve you of the tedious obligation to effect the monthly payments – by whichever method. I have a theory. I firmly believe that one of the reasons why people here don’t mind having to pay their bills by cheque or cash is that the average island monkey loves queueing. Must be so because I have never seen a single cash machine in this country that didn’t have a long queue of people waiting to draw money in front of it. 24/7. PS: Sometimes you are lucky enough to be able to settle a bill by credit card. Which takes me to a whole new topic. One day I will rant about credit cards in this country, promise. When you hear “crisp”, do you think of lettuce? Someone save me from Health and Safety! You don't know how else to kill your time and want to follow my blog? An email will be sent to you everytime the writing mood strikes me again, provided you have entered your email address here. I have been many things in my life, from HR manager to wildlife ranger, from swim coach to housewife. Right now I am juggling 2 kids and being a dive centre manager/dive instructor in a tropical holiday destination. Never a dull minute but unfortunately not enough time for regular blogging.